Your knees: you need ‘em to get around—and when they hurt, boy do they interfere with your daily life. Many of the most common causes of knee pain are pretty obvious—injury, arthritis, overuse…you get the picture. But there are plenty of LESS obvious reasons your knees hurt. Read on for some of them. Your knees can feel the pressure of up to five times your body weight, so it’s no surprise that obesity can wreak havoc on these crucial joints. Luckily, even people with difficulty losing weight can take care of their knees by doing muscle strengthening exercises. 2. You’re Exercising Too Much or Too Hard. 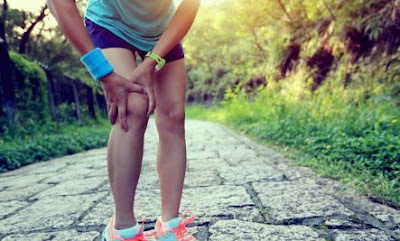 We all know that exercise is good, but, when you push yourself too hard, for too long or too frequently, it can cause major strain on your joints. In fact one study found that people who worked out the most were more likely to experience ultra-painful knee cartilage degeneration than people who worked out less often. Make sure to incorporate a good stretching routine into your workout to avoid knee injury. And, yep, if you have knee pain—skip the hard workouts! Knee pain, as you’ve likely noticed if you’ve reached a certain age, is often found in older people. The longer you live, the more stress you put on your body, and, of course, that includes your knees. Your muscle mass also decreases with age, leading to loss of body strength and, hence, more knee pain. It’s not an inevitable problem that everyone has, however—maintaining a healthy lifestyle can squash that pain even as you reach an advanced age. Gout is a form of arthritis often found in people that eat a lot of red meat. If you’re experiencing unexplained knee pain, you may want to take a look at your diet and talk to your doctor about your symptoms. 5. You Have Digestive Tract Issues. Though most commonly known as digestive tract issues, both UC and Chron’s can also cause knee and other joint pain. In fact, it’s the most common symptom of these diseases outside of the digestive tract. Luckily, this joint pain is not as severe as other types of unrelated arthritis and tends to go away after digestive tract treatment. One study looked at 9 high-quality studies for a possible link between mental health issues like depression and anxiety and knee pain. The conclusion? There is likely a link between the depression and knee pain. In addition to the lack of exercise common in folks that are experiencing depression, more and more research is showing that depression has a physiological impact on the body similar to chronic pain. This is backed up by the fact that many people suffering from both depression and knee pain experience an easing of knee pain symptoms after taking antidepressants.